A glass of wine, a loaf of bread and a lovely steak — well you can get two out of three at the Avenue of the Fountains Farmers Market tomorrow. Now about that steak you may be wondering if grass or range-fed cattle produces better beef than plain old grocery store beef. In my opinion it does. I’d rather have four ounces of juicy, rich intensely-flavored, grass-fed, rib-eye steak than eight ounces of flat-flavored, feed-lot grocery store steak. Find range-fed, antibiotic-free, growth-hormone-free beef at Rafter 6 Ranch. If you can’t pop for the steak, start out with the ground beef. 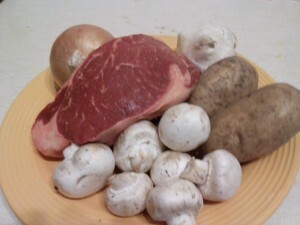 Of course if you have steak you should have a crusty loaf of artesian bread to sop up all those steak juices — or perhaps you make a mushroom sauce to go with that steak. In either case find the bread you knead (knead — need get it? Forgive me I’m a writer I do stuff like this) at Proof. I can’t pick a favorite here at Proof, I love all kinds of bread. Let’s face it I love food in general. Cooking food. Eating food. Writing about food. Did I mention eating food? I’m not a gadget person especially in the kitchen, but I meandered over to the Pampered Chef booth where there are gadgets galore and spices. I was especially intrigued by the various sized stainless steel scoops. What do you need scoops for besides ice cream? Well, the small size is perfect for cookies that come out all the same size or meatballs and cheese balls, and don’t get me started on melons and other fruits.. How many times have I had to drag out the chopping board and knife when all I wanted was half a chopped onion, a clove of garlic and a smidge of jalapeno peppers. Their manual food chopper comes to the rescue for these small chopping chores. See you at the fair tomorrow. This review is also posted on our blog in case you want to share it with someone not on facebook.